A backwards P is probably a paragraph mark. If you're seeing a backwards P it's easy to turn off, but also tells me you should change something else too. In my outlook email I now have what looks like a letter "p" and back arrows, at the end of each line! How do I remove them? What you're seeing are probably paragraph marks. The fact that you're seeing them is benign, and easy to turn off. But it also tells me a little bit about your configuration. While it's really a matter of personal preference, I see it as a sign of a larger problem. The font may be different, so the appearance might not be identical, but at the end of each line is a paragraph mark. Question 1, of course, is if it's a "paragraph" mark, why is it at the end of every line? This is one of the differences between plain text and "rich" text email. In rich text, each paragraph is represented as a single line - it's then broken into multiple lines as it's displayed to fit the window. Try it sometime in your word processor - resize the window and you'll see each paragraph "re-wrap" to fit the screen. In plain text, each line is represented by ... a line. Regardless, at the end of the line, whether it represents an entire paragraph, or just a single line, is an end of line marker. Or, in word processing terms, an paragraph mark. So why do I keep coming back to "word processing" when all you're doing is editing email? Because you're using Microsoft Word as your email editor. And Microsoft Word is first and foremost a word processor. "I strongly recommend not using Microsoft Word as your email editor in Outlook." If that setting is unchecked already, you may be viewing all non-printable characters. If you see a dot everywhere there's a space, such as between words, this is likely to be the problem. 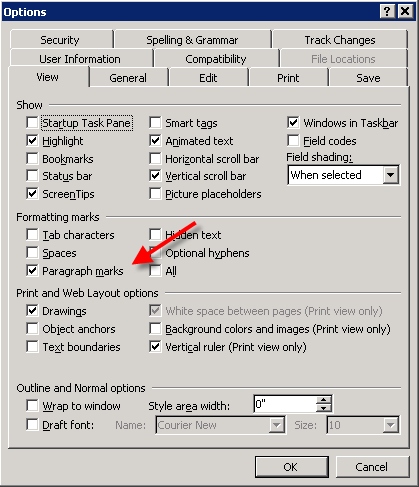 SHIFT+CTRL+* will turn that on and off, including paragraph marks. Now, you'll note that I said I see this as a sign of a larger problem ... so what's the larger problem? Using Microsoft Word to edit email. Word is a fine, fine word processor. I use it regularly. But in my opinion, it's overkill for editing email. Word is a big program packed with lots of features that aren't (or shouldn't be) used in email. If you're close to marginal on memory, Word can be particularly slow. The rich text it produces is notoriously bloated, meaning that the resulting email is much larger than it needs to be to convey the same look and feel to your recipients. I strongly recommend not using Microsoft Word as your email editor in Outlook. Once you do that email editing and viewing should be a little quicker for you, and your emails will also be smaller in size. And you won't see any unexpected paragraph marks. Ask Leo! 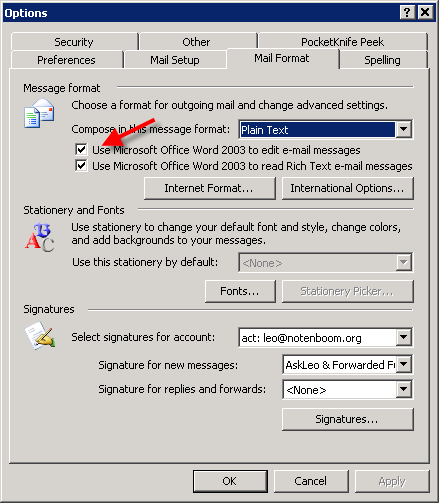 - Why doesn't my email format properly in Outlook? Ask Leo! 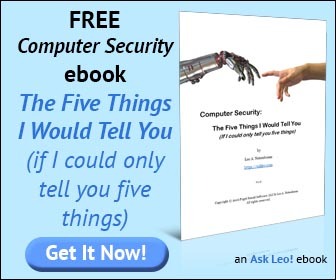 - Why is attaching a Word document to email such a bad idea? We are currently making it company policy to have Word as our editor as quite a few people here need to insert hyperlinks to documents instead of attaching documents. Inserting hyperlinks in an email is much easier with Word as Outlook editor. Would you be able to let me know the reasons for not having this? Is it only email size? I would appreciate your comments. I know that there were issues pre 2003 version but thought they may have been ironed out. We are using Office 2003. You hit on one: Word generates horrible HTML. You don't see it unless you pay attention to the size of the message, or actually take steps to look at the result. If you send email to people outside your company, the results can be quite messy if they're not also using Outlook and/or Word. And finally - Word is huge. It's a big, fat application. Using it for email is like trying to use a chainsaw to open a can of tuna. Yes, you can do it, but the process and results are messy. I don't quite understand how inserting a hyperlink is easier, to be honest. Is it really all about that one feature? You Rock! I was blazing out an email and must of accidentially hit the combo to cause this backwards P sh##. Thanks a million! Actually, that didn't work. The paragraph marks were still showing in Outlook, even though they were disabled in Word 2003. The solution was to start a new email, click Tools, then Options, then the View tab and deselect the 'All' option for Formatting Marks. THANK YOU SO MUCH FOR THE GREAT ADVICE! You were right on. You possibly saved me hours of frustration. THANK YOU! I had the same problem with my microsoft word, googled "backwards P" and saw your answer. Thanks!! At the risk of being boringly repetitive - THANKS! And I'm ditching Word as Outlook's editor at work and at home! Thank you so very much!! Super Helpful! Thank you very much! It solved my problem which was a big headache.. Thank You so Much!!! That was driving me carzy and the simple keystroke you provided was like a magic trick!! Thanks! c-sh-* solved my problem within a minute of encountering the issue. Frustration averted! I learn everything via "accidental keystrokes". Yesterday I learned that in Adobe Bridge I can press Space to make items selected for preview go to full screen. There are a lot of people that need help with grammar in addition to spelling. Outlook can check spelling, but not grammar. I have forced some people to use Word as their editor so it catches most of their rediculous grammar mistakes. hey thanks so much for the info! was getting very annoyed with these backwards P's as i had no idea what had happened! Awesome tip. Thanks heaps as I could not get rid of the paragraph mark in MS Outlook. Help was no help!. I have the same problem but showing paragraph marks is NOT checked in Word. Can you tell me any other method to get rid of the paragraph marks? This problem started yesterday when I tried to copy and paste a screen shot from the Broward County (Florida) Clerk of the Court's Office into an email. that quick fix Ctrl+Shift+* just saved me a ton of trouble. thanks ... you are the place to look for quick answers. Like I would ever guess to hit shift+ctrl+* ... and how on earth did I do that to start with. Thanks very much. I didn't like using word as the editor but didn't know how to turn it off. My marks are gone!!! YAY! Thank you for your post Leo. It was the simple Shift+Ctrl+* that solved it for me. saved me so much trouble! Thanks so much....very clear & to the point.